In working with Mid-Atlantic Deck & Fence for your new fence installation in 2019, you can ensure that your new fence will be a high-quality wood fence that is carefully installed to enhance the look of your outdoor space. As you update your outdoor space or improve the curb appeal of a home that you plan to sell, adding a wood fence to your outdoor space is a perfect choice for creating a classic look in your landscape this year. In working with Mid-Atlantic Deck & Fence for your new fence installation in 2019, you can ensure that your new fence will be a high-quality wood fence that is carefully installed to enhance the look of your outdoor space. If you are trying to choose a fence for your home in the upcoming months, consider the many ways in which a new wood fence can create a classic look for your home in the new year. Not only are wood fences durable and reliable, but they are also a timeless look for your outdoor space. Because they are simple in look and design, they can easily be stained, painted, or accessorized to complement your home exterior perfectly. A wood fence is also a perfect solution for accentuating your property with a classic look that any potential buyer is sure to love. There are several ways to customize a new wood fence so that completes the look of your home exterior. Paints, stains, and even landscape accessories such as flower beds are perfect for adding color and style to the traditional look of a wood fence. Additionally, wood fences are also clean and classic looking without any embellishment, which is especially perfect for a family looking to sell their home in the future. 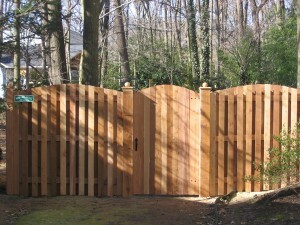 A wood fence can also contribute to safety and privacy in your outdoor space. This feature is especially appealing for families with pets and children, as your new fence will allow everyone in your family to safely enjoy your outdoor space at any time of year. If you plan to sell your home in 2019, this feature will also help to boost the value of your home and the appeal of your landscape to a potential buyer. Enjoy a New Wood Fence for Your Home in the New Year!